Hollowe’en Decorative Outfit No.77, USA, NOMA Electric Corporation, made for only two seasons; 1930 – 1932, seven celluloid JOLs: six measuring 4” in diameter and one (center) measuring 6” in diameter. The large original decorative box with lift-off lid measures 6.25” h x 13.25” square. 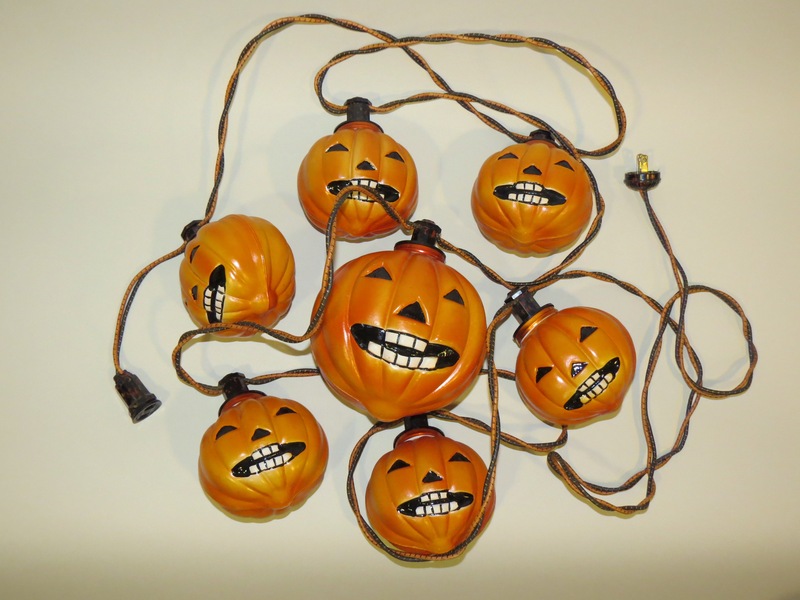 This uber-rare all original set is complete with its seven orange, exterior painted, General Electric, MAZDA trademarked, intermediate base lamps, original black and orange cloth-covered lighting strand having seven bakelite sockets and plug, seven celluloid JOLs with shiny black noses, eyes and mouths, having ultra-white gleaming teeth. The vividly colored decorative box retains its original NOMA identification label and is chock full of untorn, original and authentic, full-sized tissue paper packaging material. This set’s high-quality condition reflects the fact that it had been stored away for decades, having only recently been liberated; in all probability an unused set. A top-shelf example in remarkable condition worthy of our Private Reserve Collection. A handful of NOMA JOL lighting strands have surfaced at prominent auction houses and online venues, although most were either mis-matched (proportionally inaccurate) or damaged, while none included its original box. The NOMA Decorative Halloween Outfit. 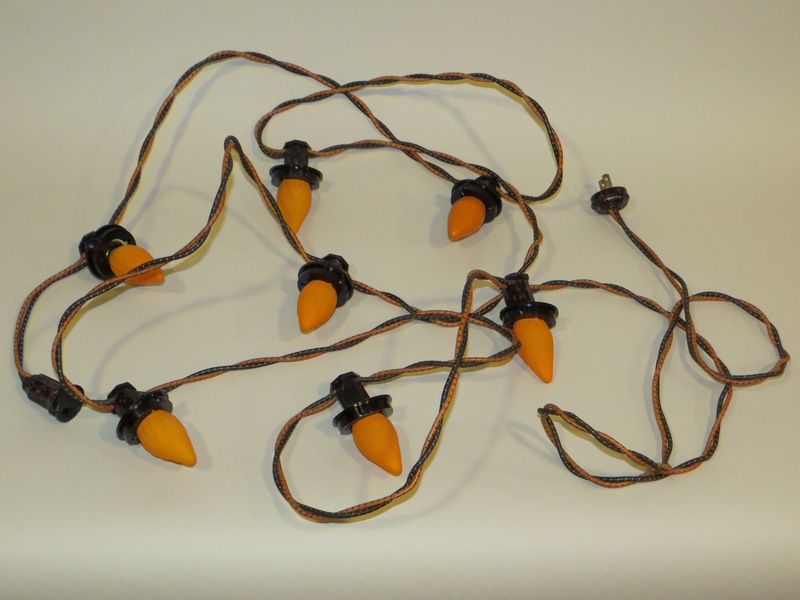 This ultra-rare all original set, including its elusive original box, comes complete with seven orange, exterior painted, General Electric, MAZDA trademarked, intermediate base lamps, original black and orange cloth-covered lighting strand having seven bakelite sockets and plug, seven celluloid JOLs with shiny black noses, eyes and mouths, with white gleaming teeth. The set’s decorative box retains its original NOMA identification label and comes chock full of its original full-sized tissue paper packaging material. This set’s high-quality condition reflects the fact it had been stored away for decades, having only recently been liberated. A top-shelf example in pristine condition. 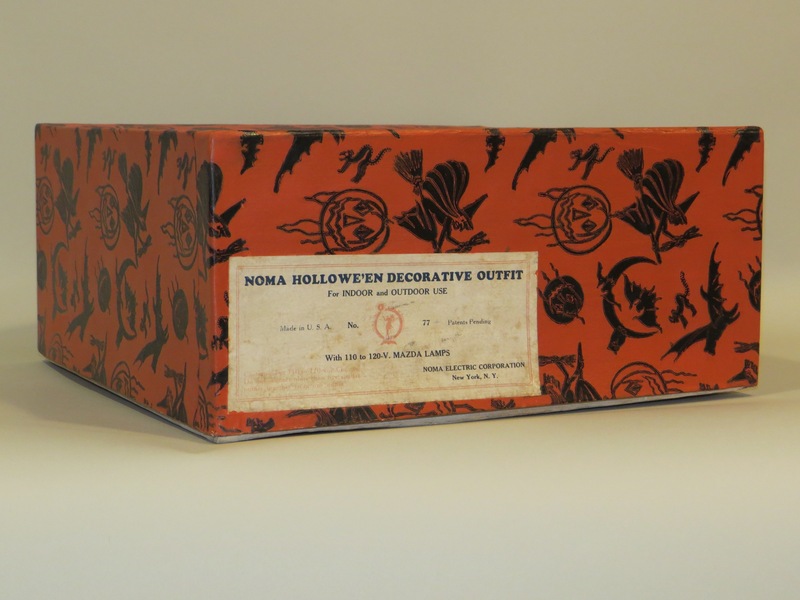 NOMA introduced their first indoor/outdoor decorative Halloween lighting outfit in 1930. The NOMA Decorative Hollowe’en Outfit No. 77, as entitled on the box’s label, consisted of a cloth-wrapped electrical lighting string having seven sockets in which seven molded and painted celluloid JOLs; each having wide toothy grins, six measuring 4 inches in diameter while the seventh, which hung in the center of the festoon, measuring 6 inches in diameter were attached. 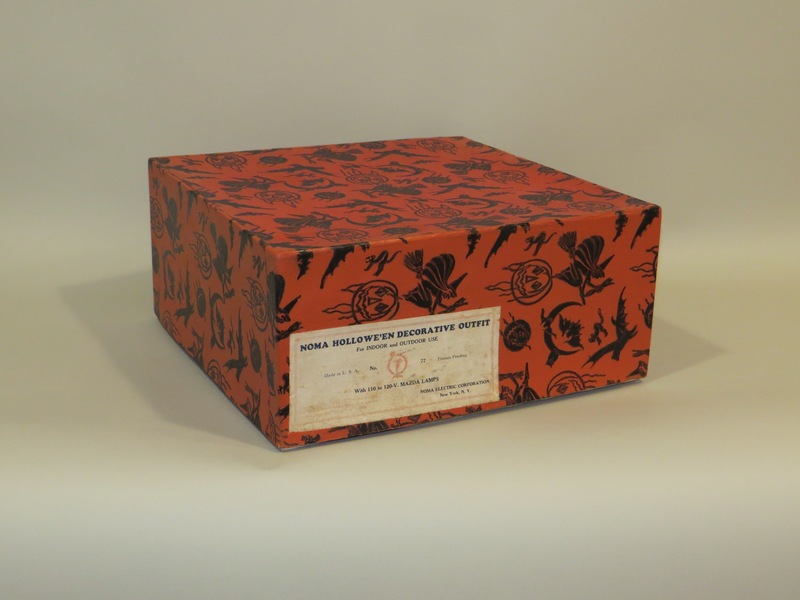 The complete outfit was sold in an orange litho over cardboard box having a repeating pattern of black broomed witches, bats, owls, crescent moons, arched-backed cats and JOLs. The decorative box, made of flat stock medium cardboard, measured 6.25” h x 13.25” square. The decorative Hallowe’en outfit was illuminated by MAZDA trademarked intermediate base lamps which are made of brass and are screwed into a socket. The company proudly stated they used only MAZDA trademarked lamps in their outfits primarily purchased from General Electric. It’s somewhat of a mystery why NOMA choose to spell the word Hallowe’en with an “o” opposed to an “a”. Further baffling, as manufacturers commonly spelled the word Hallowe’en with an “a” throughout the 1920s and 30s. No documentation could be found to substantiate the use of the word Hollowe’en. Therefore, a phonetic analogy due to uneducated or careless speakers often modifying uncommon sounds to make them match more familiar ones seems probable. So, for example, we often hear Halloween pronounced as if it were spelled Holloween. This is a case of purely phonetic analogy, the commoner sound “hollow” winning out over the less frequently heard “hallow”. Furthermore, the word Hollowe’en does not make etymological sense in conjunction with the holiday since the root “hallow” is an obsolete word for saint. The name Halloween is actually a shortened version of All Hallows’ Eve, the eve of All Hallows’ Day. The word “hallow” being an Old English word for holy person or saint. The decorative Hallowe’en outfit was illuminated by MAZDA trademarked intermediate base lamps which are made of brass and are screwed into a socket; commonly referred to as C-9 lamps. The company proudly stated they used only MAZDA trademarked lamps in their outfits primarily purchased from General Electric. This externally painted flame swirl lamp is original to the set and bears the MAZDA MADE IN USA incised name. The NOMA Electric Corporation began advertising their new decorative Halloween lighting outfit in popular women’s magazines and trade publications but by 1932 production ceased citing poor sales. The debilitating effects of the stock market crash afforded far fewer families the luxury of buying Christmas lights, least of all Halloween lighting outfits. NOMA was an American company best known for making Christmas lights. Formed in 1925 as the National Outfit Manufacturer’s Association, a trade group made up of 13–15 smaller manufacturers hoping to gain competitive advantage by combining their marketing and purchasing power. In 1926, the association’s members officially incorporated as the NOMA Electric Corporation and began selling NOMA-branded light sets. 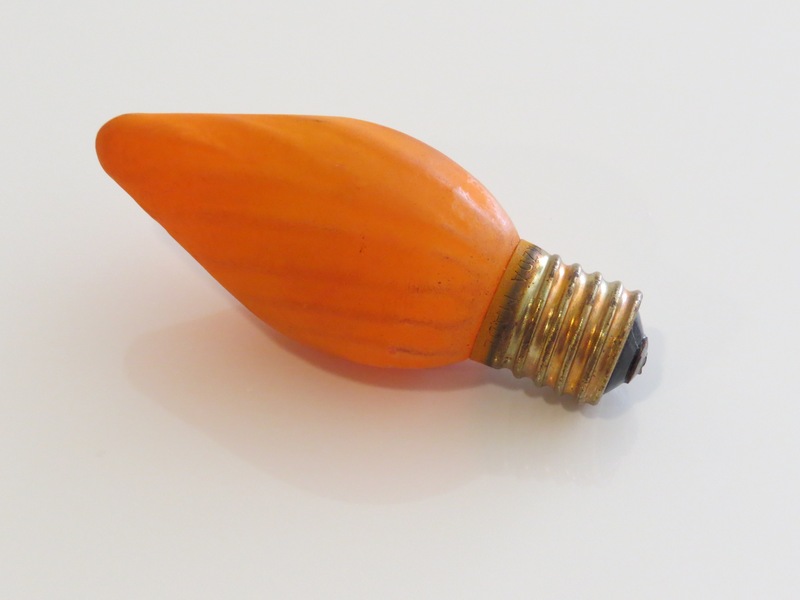 In 1953, NOMA incorporated its Christmas light manufacturing operations into NOMA Lites, Inc. and enjoyed considerable success. But by the early 1960s the company faced increasing competition from cheaper imported light sets and subsequently filed for bankruptcy in 1965. Once the largest manufacturer of holiday lighting in the world but since 1967 has existed only as a licensed trademark. It is now held by Inliten, LLC, of Glenview, Illinois. NOMA’s Hollowe’en Decorative Outfit No. 77 is very hard to come by complete; the original decorative box being ultra elusive. Its brief production run, coupled with the natural fragility of celluloid, greatly contributes to its scarcity today. A handful have surfaced at prominent auction houses and online auction venues, although most were either mis-matched (proportionally inaccurate) or damaged, while none included the original box.